Here in the UK a mini heatwave has descended. If you make lunch to take to work each day your normal sandwich may not seem very inviting in the hot weather. 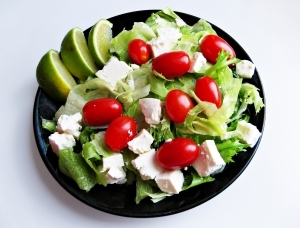 The obvious choice for a summer lunch is salad, but a couple of days of chopping stuff up in the evenings only to eat limp lettuce leaves and warm dressing by lunchtime the next day can put you right off. So how can you take an interesting salad to work and have it in a fit state to eat by the time lunch comes round? Get a decent size insulated lunchbag to carry your food in. Supermarkets sell some and so does Amazon. You may need to search under “children” simply because lunch bags are marketed at this section of the population – but do double check measurements if shopping online to make sure it’s big enough. If you don’t have access to a fridge at work get some mini icepacks to put in your lunchbag. Lots of tiny ones is best – I have three. Again, Amazon or the supermarkets is a good place to start looking for them. In the supermarket you may need to look in the freezer equipment section or the picnic section rather than the lunch section. Get some Ziplock freezer bags or small plastic tubs. Once every three or four days have a salad chopping up session. Store each type of vegetable in a separate bag or tub in the fridge. When you come to make your salad you have then already done the difficult bit and can just tip all veggies you want straight into your lunch box. You can do exactly the same for other salad items – pasta, couscous, hard boiled eggs. Think about how you can prepare three or four days at once to make life easy. So, what can you put in your salad? Lettuce – iceberg, romaine or round. Pre-prepared lettuce or salad bags. These give you a variety of lettuce you may not be able to get any other way. Keep an eye open for the cheapest options, offers, and the budget ranges. It doesn’t matter if the contents aren’t that exciting because you will be adding more to it. Avocado – a good choice for adding healthy fats to lunch. Although don’t chop it up in advance or it will go brown. Take a sharp knife with you. Cherry tomatoes, baby plum tomatoes or pomodorino tomatoes. I wouldn’t advise pre-slicing tomatoes, as they tend to go soggy. That’s why the cherry-style is best. Chopped chicken – leftover from a roast, or try flavored slices from the supermarket, or grill breast pieces at home with a sprinkled on topping like barbecue or chargrill. Hopefully that is a bit of inspiration towards preparing a summer salad. Let’s hope the summer hangs around a bit longer so we can put it into practice! I have one pretty much every day for lunch, and it is MASSIVE and contains a whole slew of things, including not only healthy greens and salmon and vegies but also treats like goat cheese, pear slices, walnuts etc. But I’m lucky enough to work from home or I’d have to take my salads to work in a wheelbarrel! Ha ha I was thinking I need to get a bigger lunch bag it has to be said!